USGoBuy Package Forwarding Service specialized in forwarding parcels from USA to worldwide! Provide you a US mail address; Make your US online shopping extremely easy! 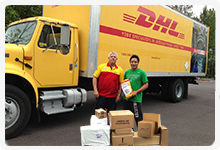 Our service is here to assist friends from the whole world to safely ship items from US. Being customers ourselves, we understand the frustration of being unable to buy from US online stores because of the high international shipping fee or because the stores do not ship outside of the U.S. Change BUT for But with USGoBuy, from now on, you will enjoy shopping freely in US without any worrying about the shipment, and HOW? Start from registering as a UsGoBuy member for FREE and GET YOUR US MAIL ADDRESS! USGoBuy is proud to be in partnership with some of the logistic and banking world's most respected brand names. Through these alliances, UsGoBuy continues to provide the highest service levels to our customers. PayPal is the safer, easier way to pay and get paid online. The service allows anyone to pay in any way they prefer, including through credit cards, bank accounts, PayPal enables global ecommerce by making payments possible across different locations, currencies, and languages.